If you are giving this as a gift or would like a special message on the plaque, please give us the details here. 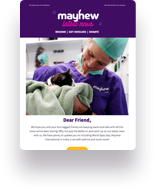 Yes, I am a UK Taxpayer and I want to Gift Aid my donation and any donations I make in the future or have made in the past 4 years to Mayhew. I understand that if I pay less Income Tax and/or Capital Gains Tax than the amount of Gift Aid claimed on all my donations in that tax year it is my responsibility to pay any difference.